In collaboration with Mart Museo di arte moderna e contemporanea di Trento e Rovereto. Continuing the series of monographic exhibitions dedicated to the theme of painting and colour, which characterised the 2013 project In Pinacoteca. Finestre sul contemporaneo, itself the result of a collaboration between the MAG and the Mart, the Museo di Riva del Garda is now hosting a one-man exhibition dedicated to Italo Bressan, a Trentino-born artist and professor of painting at the Accademia di Belle arti di Brera in Milan, which will explore new aspects of the research areas already touched upon in the previous exhibitions of Claudio Olivieri, Aldo Schmid and Luigi Senesi. The title of the exhibition, Anime (Souls), takes the last cycle of works by Bressan as its starting point. The artist’s work has always focused on the theme of colour, on its emotional and evocative expressive value. The show will present approximately thirty paintings, covering a period of time from the late eighties to the present day, comprising works that are on display for the first time. The artist uses multiple modes of expression, each of which prevails over the other as the creative seasons follow on from each other: symbols and marks, saturated opaque or material colour and transparent and nuanced veils of colour. 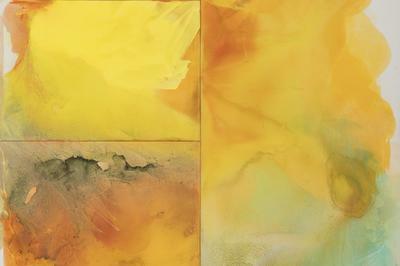 This variety is also reflected in the different media and techniques adopted: canvas, paper on panel, glass, tulle, oil paint, enamels, acrylics. “Italo Bressan's painting tends towards the sublime, building on its strength of ectoplasmic and shimmering forms”, explains the curator, Daniela Ferrari. “They are sinuous and welcoming, part of a challenge of colour that can be bold, without mediation, pure, challenging and bright, but also shadowy, mysterious and hidden in thin veils or in mixed tones”.